Cannot be Normal Summoned/Set. Must first be Special Summoned (from your hand) by banishing 1 LIGHT and 1 DARK monster from your GY. Once per turn, if a monster effect is activated in the hand: This card gains 300 ATK until the end of this turn. When this card destroys an opponent’s monster by battle: You can banish 1 card from your GY; add 1 Thunder monster from your Deck to your hand. Once per turn, during your opponent’s End Phase: You can target 1 of your banished cards; place it on the top or bottom of your Deck. Thunder Dragonduo should have been Dragontrio because of its effects. Chaos-style with its summoning conditions, easy to facilitate in the archetype. 2800/0 are good stats. The ATK boost of 300 by activating a monster effect in your hand isn’t too impressive, especially with it ending during your turn. An increase of 300ATK by the level would’ve made it much better. If you destroy a monster with this you can banish a card of yours in the grave to search a Thunder monster. Banishing a Thunder Dragon will trigger its effect, netting you a +2 advantage in total. Let’s say you just need this thing to sit out there and protect your life points, at your opponent’s End Phase, Dragonduo can retrieve a banished card of yours and put it on top or bottom of your deck. Got a Thunder Dragon monster you need to activate? Stack that on top. Need a resource back in your deck? To the bottom or top you go (depending on your strategy). The fact that you can even retrieve spell and traps that you’ve banished is handy, as you may have banished some with Thunder Dragon Titan. A pretty good monster, but I can’t help but think running a standard BLS or Chaos Sorcerer would be better. The final main deck Thunder Dragon before we go into Throwback Thursday and the card you are probably expecting on Friday is Thunder Dragonduo. Dragonduo is a Level 8 DARK Thunder with 2800 ATK and 0 DEF. ATK is great, DEF is not, DARK and Thunder are obviously good at this point. Dragonduo cannot be Normal Summoned or Set and must first be Special Summoned from the hand by banishing 1 LIGHT and 1 DARK monster from your GY. We’ve seen this summoning condition a few times throughout the years, and we know how easy it can be to achieve, but the question is… is this the best card to summon that way? At least in Thunder Dragons, this will trigger the banishing effect of the Thunder Dragon monsters. Once per turn, if a Thunder monster activates its effect in the hand, this card gains 300 ATK until the end of the turn. 3100 isn’t anything to laugh at, 3600 if you used Dragonmatrix on this and that 500 ATK boost is permanent, and the boost doesn’t really have to last forever since 2800 ATK is good enough to kill some decent monsters. When this card destroys an opponent’s monster by battle, you can add 1 Thunder monster from your deck to your hand by banishing 1 card in your GY. 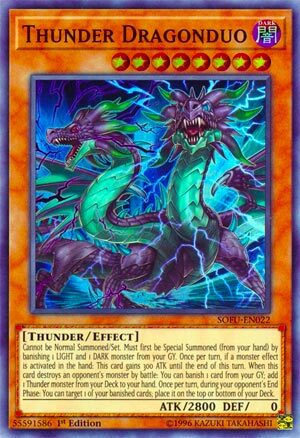 Easy generic searching for any Thunder deck as long as they play LIGHT and DARK monsters, and you don’t even have to use Thunder Dragons for this, but if you are playing this outside Thunder Dragons you are most likely banishing Spells and Traps in the GY. Also once per turn, during your opponent’s End Phase, you can take 1 of your banished cards and place it on the top or bottom of your deck. Imagine banishing some powerful card like Monster Reborn or Raigeki or Solemn Strike for this cards search effect and then putting it back on top of your deck at the end of your opponent’s turn to draw into again. You can also grab important monsters for combos and stuff. The only flaw of this card is that it can seem a little win-more in Thunder Dragons, as they have more than enough to not need this, and you are probably playing BLS – Envoy or maybe even the newly errataed Chaos Emperor Dragon or the new Pendulum Chaos Emperor Dragon that’s a prize card, but playing one in a Thunder Dragon deck can be nice to have and this can be worth considering in future Thunder decks that use LIGHT and DARK monsters. Art: 4/5 What is scarier than one Thunder Dragon? Two Thunder Dragons, or a two-headed Thunder Dragon in this case, much better than Twin-Headed Thunder Dragon at least. Guess we finally see (as if you didn’t know) why we have Dark Thunder Monsters now, so you have Dark Monsters to feed for this that still fit your Thunder Dragon theme. So, once a turn you gain 300 attack (3100 now) when a Monster effect activates in the Hand…THE Hand, so not just yours. Versatility is always a good thing even if you only get a power-up once. But does a 2800 attacker need a power-up effect? Very likely not? Nice to have but unnecessary more than not I feel. You can also add a Thunder Monster from your Deck to your Hand by removing one of yours from your Graveyard from play, after Dragonduo destroys one of your opponent’s Monsters. This is good, too, as it’s yet another versatile piece and search/cycle. The last ability I find the most useful, where at your opponent’s End Phase you have the option to Target and add one of your removed cards and add it to the top or bottom of your Deck. This might seem contrary, but I do like that said card here doesn’t have to be Thunder or ‘Thunder Dragon’. Honestly, you could probably use this card in other Decks. Getting one Light and Dark to remove to bring it out isn’t bad, and retrieving any removed card is awesome…still, I do feel this piece, cool as it is, might be the first one we looked at that isn’t a FOCAL point in the Deck. Not to say it’s bad though.